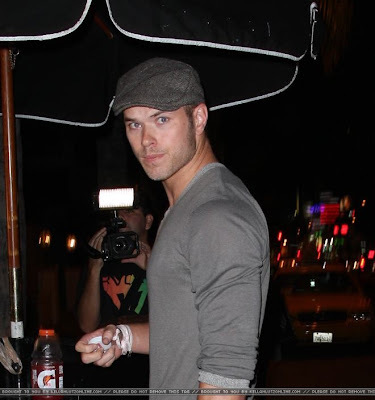 More pictures of Kellan this week. He was at the French Connection Summer Experience Day 2, seems like he was a modeling some clothes....I think you need to scroll down for the best pics! Now this is what I'm talkin' about! This is the way Twister should always be played!! 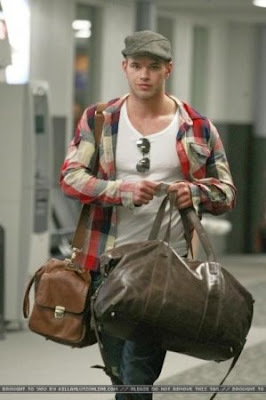 Youhave a HOT friend in a fitted shirt, sit there & drool! 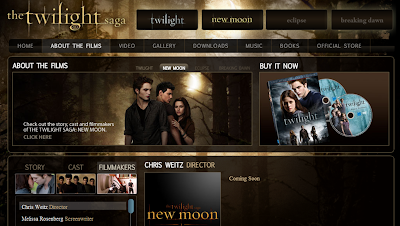 The World of Twilight is the official home the Twilight Saga, this is the site where you'll be able to get the latest TwiWorld updates. 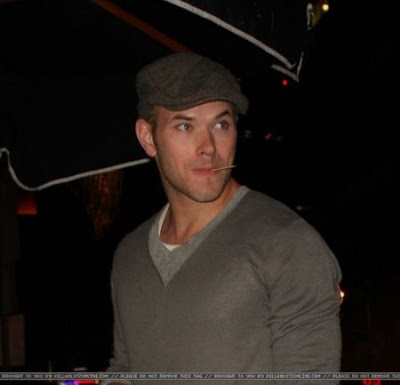 Kellan Lutz & Ashley Greene off to Twicon? Twilight actress was seen typing away on her iPhone as she approached the limo. 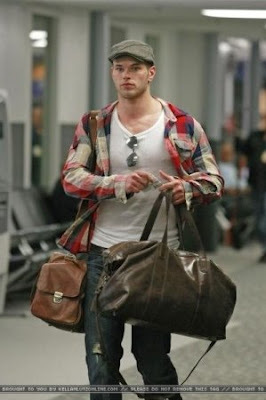 Jus Jared speculate she's off to Vancouver? 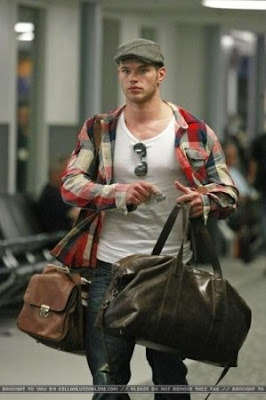 And Kellan Lutz Online has photos of Kellan at the Burbank Airport possible going to TwiCon? or Vancouver? 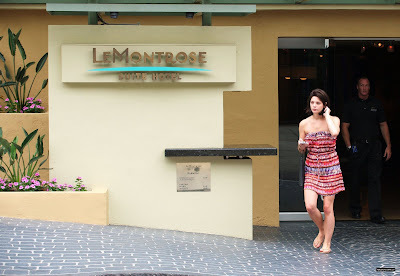 New photos from July 30th, where Ashley Greene stopped at Le Montrose Suite Hotel. 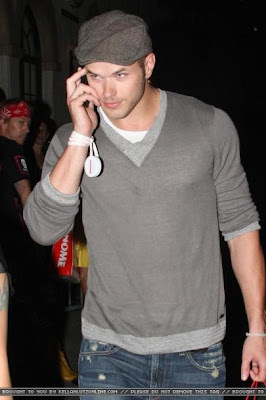 Kellan Lutz Online posted pictures of New Moon Hottie Kellan Lutz leaving the Jared Gold fashion show in Hollywood. 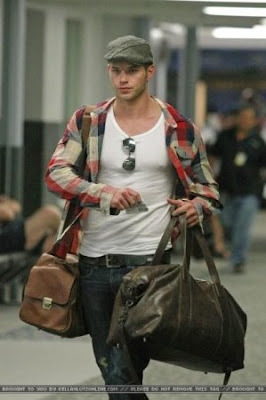 It also looks as if Kellan was carrying a goodie bag. What do Taylor Lautner and Taylor Swift have in common other than their first name? They're both starring in Valentine's Day with Emma Roberts. Socialife Lite posted over a 100 pictures of the young stars prepping for their kissing scenes. *waves* Hi everyone! It's been awhile, sorry! Between work and Comic Con, I have been a very busy girl. In fact, so busy that I have not had time to read anything new this week. So, my wonderful sister, Tammy, graciously agreed to do a guest rec for me. I hope you're as excited as I am to read this fic! PLEASE NOTE: SOME OF THE CONTENT RECOMMENDED HEREIN MAY NOT BE SUITABLE FOR OUR UNDERAGE READERS. FICS RATED 'M' ARE INTENDED FOR THOSE OVER THE AGE OF 18. 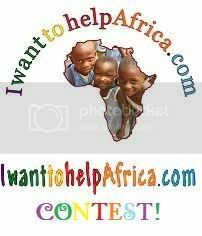 PLEASE USE DISCRETION WHEN CLICKING ANY OF THE BELOW LINKS. Summary: Bella was thought to have died shortly after giving birth to Nessie, and Edward gave up shortly afterwards, knowning no better. After 17 years away, thinking her parents were be dead, Nessie returns to Forks to find the two people she thought she had lost. I wasn’t a fan of FanFic until Wide Awake and after that I immersed myself in this new world and can’t seem to leave. Even though I was fascinated with the Bella/Edward Saga I wanted to read about Nessie. And I was sadly disappoint how almost every writer made her this immature, dependent on mommy and daddy irritating little girl. Just as I was giving up I found Horizons, the story was simply different. What if Bella did not survive the change? What if Edward killed himself leaving his baby girl with his family after Bella died? I was instantly engaged in this story from just the description alone. I’ll never forget that night thinking I will read a chapter then head to the movies. Within the first chapter I felt the guilt and pain Nessie was feeling, the wound was so deep I wish I could comfort her (I know its fiction but it GOT ME!) and yes I cried. With Rosalie and Emmett raising her in South America she was determined to meet Charlie and live in Forks to find some form of peace. There are some amazing moments when she visits her parents graves that simply breaks your heart and meeting Charlie for the first time. But at the same time there is a new mystery the Cullen family must resolve with the Volturi, Ben (You’ll have to read to figure out who Ben is!) and of course Jacob who has not been in Forks since the day Bella died. ...I've got to say I'm intrigued with this from Tammy's description, and I am so not usually interested in Nessie stories. I hope you'll give this story a chance (as I will) and report back to us your thoughts! P.S. isn't that banner gorgeous? I am mesmerized by it. That's a perfect representation of Nessie. Have a fic you'd like us to review? Comment below or send me at email at xwearingwordsx [at] gmail [dot] com. 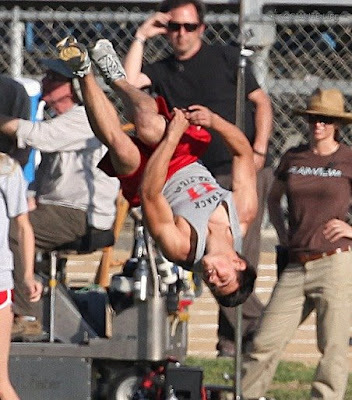 New pictures of New Moon star Taylor Lautner (Jacob) on the set of his new film Valentine's Day with Emma Roberts and Grey's Anatomy's Eric Dane. Lautner is set to reprise his role as Jacob Black when Eclipse starts shooting with new director David Slate on Aug. 18th. 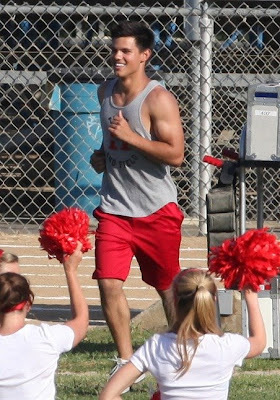 How come guys didn't look like this when I was in High School? Even though I'm not a Jackson fan I love this commerical from his pre-Twilight Saga days,I thought this was cute. Enjoy Team Jasper!! Those of us who may or may not have paid good money in today’s current economic situation to watch Twilight in the movie theaters in excess of 8 times, if not more and buy multiple versions of the DVD and other Twilight relate merchandise. Those same people who have waited countless hours in lines for DVD Releases because there was a chance we would get to meet a cast member, sleep overnight outside in San Diego to get a good spot to view the New Moon Panel at Comicom, discovered the 100 Monkeys, and the Dills, those people are unfailingly loyal. Rachelle Lefevre was, is, and always will be our Victoria. So understand that our general frustration is not so much with you but with Summit. While we love them for taking that risk with Twilight in the first place, their constant quest for the almighty dollar is a smidge annoying. Had it been up to most of the critics Twilight would have been dead in the water. It was and will continue to be the fans that keep this franchise going strong. 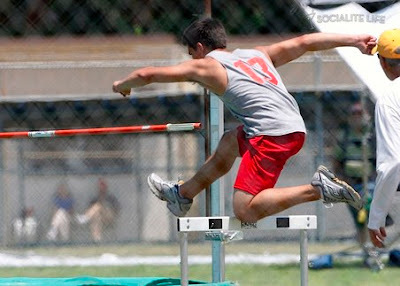 Moving on… You have some pretty important shoes to fill, and now is the time to step it up and show us what you got. I am sure that it is not lost on you that Eclipse is pretty much all about Victoria and her chance to hurt Edward the way he hurt her. Twilight and New Moon pretty much set this up. And now it has been handed to you on a platter. If you want to put all of us grumbling fans in our place, step up and show us what your made of. Play the part of Victoria with all your heart. I, for one, would love to be proven wrong. Robert Pattinson says good bye to LA.....Again! 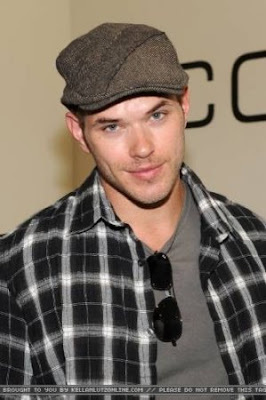 Kellan Lutz "Monkey Man" In Action!! Robert Pattinson in Vanity Fair? Barbie. Can. Not. Win... Go Team Edward! New Moon to Premiere... in Knoxville? New Bobby Long Online Store! Thanks for the Shout Out Gallifrey Reject!!! Bobby Long In San Francisco For One Night Only!